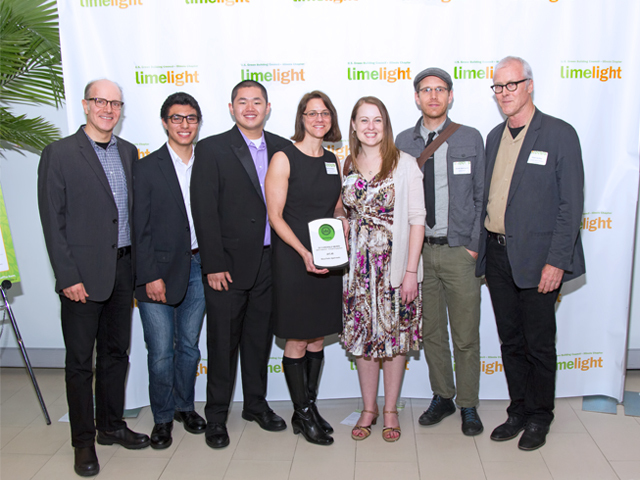 The U.S. Green Building Council – Illinois Chapter celebrated eight winners in the sustainability realm during the annual Limelight Event at the National Hellenic Museum on May 23. The Chapter’s Emerald Awards recognize outstanding individuals, organizations, corporations, projects, and technologies implemented across Illinois which advance both buildings and communities to become more sustainable, prosperous, and healthy. 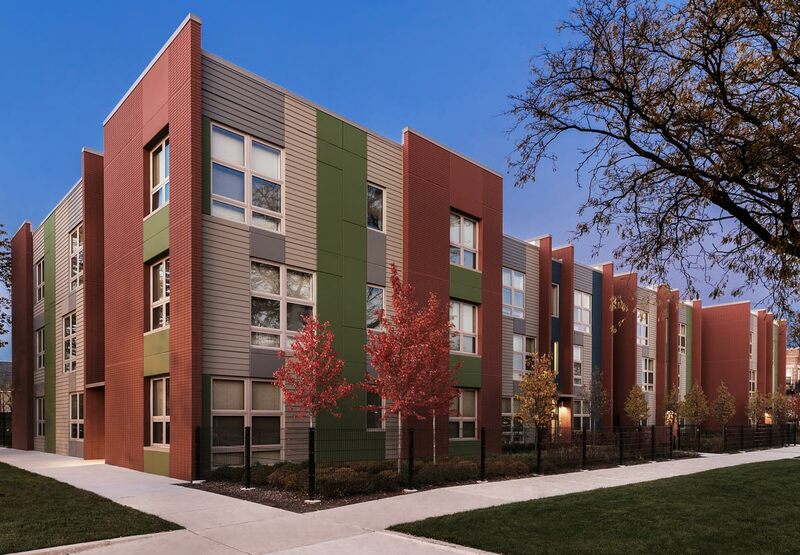 Under the Occupant Engagement category, airLab at Rosa Parks Apartments received the Green Innovation award. LBBA was honored to accept the award alongside two of our airLab mentors, Michael Wu and Pedro Medrano, as well as Daniel Splaingard and Andrea Traudt representing Bickerdike Redevelopment Corporation. To address educational and environmental concerns at the recently completed Rosa Parks Apartments, LBBA and Bickerdike partnered to facilitate “airLab;” a 6-week summer workshop to develop youth resident green leaders to study indoor air quality (IAQ) and educate other residents on its impacts on their daily lives.The inaugural airLab employed five local high school students and three college-aged mentors to study building design and initiate change in their neighborhood through environmental assessment studies and community asset mapping. Participants traveled to Rosa Parks in teams to survey residents for their feedback on Bickerdike’s green education manuals and activities, including selected Enterprise Toolkit resources, and on their “green lifestyle” choices and habits, with a focus on IAQ. 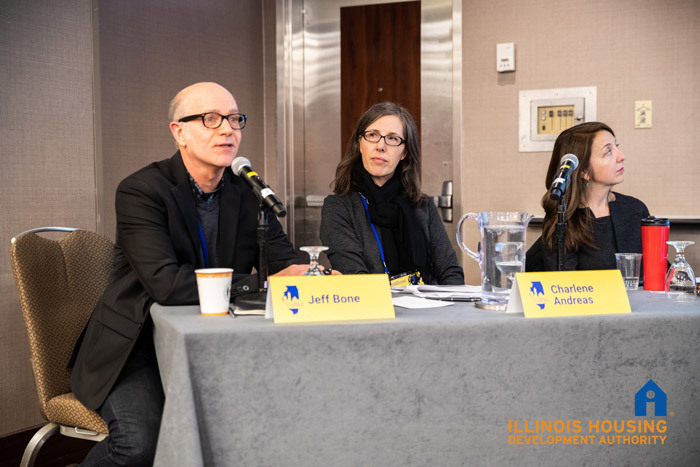 They investigated, quantified, and compared the IAQ at 541 N. Homan, a recently certified LEED Gold building, with that of 3341 W. Ohio, a non-LEED certified building by building and monitoring sensors. The students worked side-by-side with architects at LBBA to study sensor technology, design measurement tools, and track and compare IAQ information. They also analyzed their data, created data visualizations, and hosted weekly “Smartluck” lunches which are lunch and learns designed to provide students the opportunity to collaborate with local experts to enhance their work. Finally, airLab participants hosted an event for all Rosa Parks residents to present their findings and disseminate the information in an engaging manner.